Just one night after G-Eazy wraps his sold out The Beautiful & Damned Tour at the legendary Radio City Music Hall in New York City, the multi-platinum Bay Area rapper has announced the second edition of his Endless Summer Tour with Lil Uzi Vert. 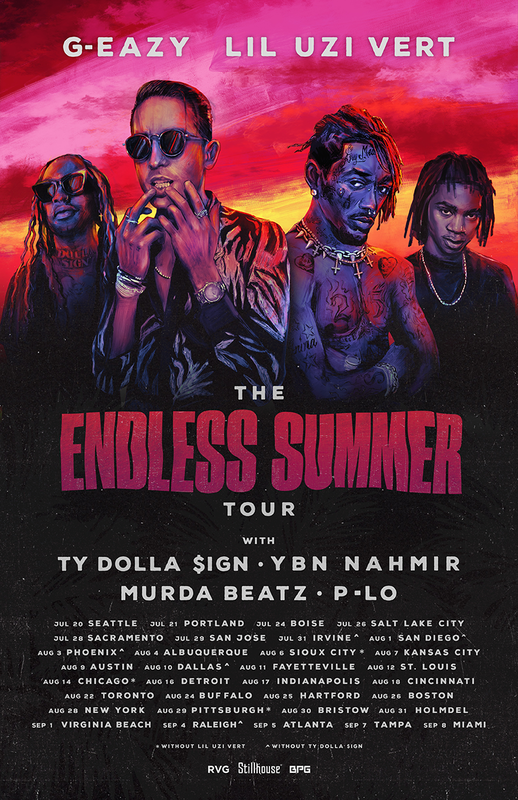 The 32-city tour includes Ty Dolla $ign, YBN Nahmir, P-Lo, and special performances by multi-platinum producer and DJ Murda Beatz. The tour begins on July 20th, 2018 in Seattle, WA and touches down at major market amphitheaters and pavilions throughout the US until the final show on September 8th in Miami, FL (full dates below). Tickets go on sale to the general public starting Friday, March 23 at 10am local time. Dates, tickets and more information can be found here and here, pre-sale available now. Directed by Rob Semmer, Creative Director at the The FADER, These Things Happened takes viewers behind the scenes of G-Eazy's amazing ascent to chart-topping rapper. The YouTube Spotlight Story mixes concert clips, backstage interviews, and documentary footage of the rapper's hometown, including on the street corners where he used to hand out mixtapes more than a decade ago. Today, G-Eazy boasts more than 4 billion views across YouTube, with his recent hit, the RIAA Certified Triple Platinum "No Limit" reaching as high as #3 on the YouTube Music US Top 100 tracks chart. 2017 saw the release of G-Eazy's studio album, The Beautiful & Damned, an intimate 20 track double-album and just last week he released a video for his third single "Sober" from the LP featuring Charlie Puth with the announcement that the second single from the album "Him & I" with Halsey reached #1 on Billboards Mainstream Top 40 Chart. Don't miss 'The Endless Summer Tour' kicking off in July, the new YouTube Spotlight documentary and keep up with Young Gerald here.